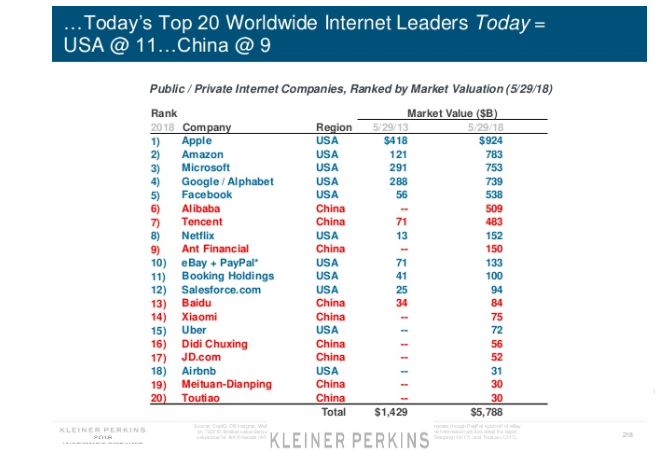 Here is the 2018 Internet Trends by Kleiner Perkins’ Mary Meeker. You may pay attention from slide 216 where you can see how China has cut into U.S. Internet dominance: Five years ago, only two of the top 20 internet companies were Chinese; now nine are, just behind the U.S.’s 11. Interestingly, no other country broke into the top 20! Talk of two superpowers and duopoly world. In the 294-slide document, they mentioned “Africa” twice, both on footnotes, referencing an ITU data. Nigeria did not make it. Reading the document, it does seem like Africa is not even in the world. If not, how could the most authoritative Internet Trend document in the world which many funds depend to wage money on startups and companies could not make a page on Africa. Yes, we need to earn it – I understand that! Nigeria…lol. You need to realize that Maslow’s hierarchy of needs apply even in mundane things. We have not gotten the basics of steady food, shelter (accommodation, water and electricity supply) right. Our roads are death traps and you are talking about technology. Where are our research centers? The humanities and arts thrive well more than the sciences in Nigeria because the society is their laboratory unlike the pure sciences. Let us try and get the basics first.